British Politicians continue to pour scorn over the Dictatorship in Myanmar and I too am pleased to hear of the release of Aung San Suu Kyi, there are some disturbing parallels. Apologists, will undoubtedly claim this is the ramblings of someone unhinged and it is a disgrace to compare Control Orders and an abhorent dictatorship in Myanmar. The controlee does not know the accusation or case against them and is powerless to dispute it or show their innocence. Under a control order you might never know the accusation against you, and never have the chance to clear your name. Control orders enable the Home Secretary to impose an almost unlimited range of restrictions on any person they suspect of involvement in terrorism. Parliament must vote every year to continue the control order scheme. (c)the use or threat is made for the purpose of advancing a political, religious [F2, racial] or ideological cause. (3)The use or threat of action falling within subsection (2) which involves the use of firearms or explosives is terrorism whether or not subsection (1)(b) is satisfied. (d)“the government” means the government of the United Kingdom, of a Part of the United Kingdom or of a country other than the United Kingdom. A Report by Lord Carlile of Berriew Q.C. for purpose, subject to some alteration. whom the discretion is vested. We have a dangerously weak definition of terrorism, which at present could be interpreted, if the state so minded, to define that Protest Demonstrations where violence was perpetrated could find themsleves becoming proscribed and therefore fall under the definition of a terrorist organisation. The feminist movement went as far as threatening to kill MPs- Terrorists? The Poll Tax Riots – Terrorists? Anti-terrorism laws are being used by councils to look in your dustbin. As long as we continue to have Control Orders in this country, expect more Aung San Suu Kyis’ to be detained in this country. How does blog hosting impact your legal situation? and quoted a so called ‘important’ political blogger on UK politics, who goes by the name of Guido Fawkes. These two people set themselves up as relevant and important bloggers in the UK. Pickledpolitics – Sunny – has, to his credit actually got off his arse and attended a climate camp demo. 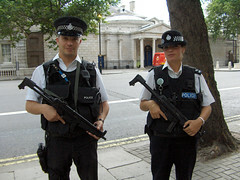 But as far as I am aware that consisted of the Greenwich, happy clap demo in September, where even the Police got bored. Pickledpolitics posed the question, should bloggers be worried about legal consequence and he was impressed that Mr. Staines had a convoluted legal set-up which protects him from legal action. Unfortunately the convoluted process is too difficult for Mr. Staines to follow. ‘…Factual correction: I am not legally the publisher. I also mispoke in that interview, the publisher is actually in Nevis, which is not that far from the Caymans. Got offshore entities muddled. Nor am I “always mostly in the UK” as, so far, unsuccessful plaintiffs have discovered. Incidentally, I have a mirror site on standby in a fourth jurisdiction. The URL itself is registered in a fifth jurisdiction after the Merrills / Northern Rock memorandum domain registrant based legal attack. I live and learn. Mr. Staines has to retract, he isn’t even the publisher of his articles, so can be absolutely discredited as a blogger and he doesn’t quite understand Geography, but sees fit to pontificate on the UK. Far beyond this, a genuine blogger stand by his/her posts, many have died or ended up in jail for their beliefs and comments. The whole post that Bloggers need legal protection stinks of tails up the arse, that is not blogging, that is a corporate gig. They pretend they are important individuals, but eventually the truth comes out, they don’t publish their own articles, they don’t know where the website is based and they really are not too sure about anything, other than their arses are safe. Anarchy in the UK is published in the UK, by a UK national who is prepared to take any libel action thrown at it. With absolute disdain and contempt for bloggers on the corporate gig and more interested in their own tails than actually standing by what they write. This post is filed under bureaucrats, as in arrogant tossers who are not spending their own money.